Some of the best creative marketing blogs for businesses in the creative industries, digital industries and the cultural sector are listed here. 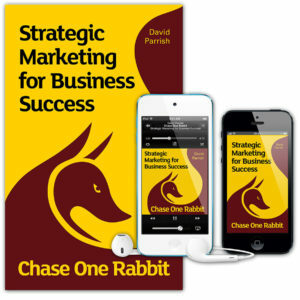 Some of these best creative marketing blogs are extracts from the 63 marketing techniques, tips and tales in the book ‘Chase One Rabbit: Strategic Marketing for Business Success’ by David Parrish. It’s available now as an Audiobook, eBook and paperback. Chase One Rabbit combines inspirational stories and practical techniques, inspiring entrepreneurs to make their businesses even more successful by using smart marketing that fits with their values and objectives. Listen to Audio Sample of David introducing this “Marketing for Creatives” book. David Parrish has worked around the world with creative entrepreneurs, small businesses, digital SMEs, arts organisations and business development and support agencies. He has worked with hundreds of businesses in more than 30 countries. He specialises in creative and digital industries, helping entrepreneurs use the creativity they employ within the business on their business, devising and implementing new business models and clever marketing strategies. Chase One Rabbit is his second book, following one of the most highly-acclaimed creative business books ‘T-Shirts and Suits: A Guide to the Business of Creativity’, which has been published in translations in seven countries. According to Ray Hanks, Chase One Rabbit is the best marketing book he’s ever read (see his quote above). 5 Is there a market in the gap? 12 What’s your competitive advantage? 19 What does growth mean? 21 How many customers do you need? 36 Is it really a feasibility study? 43 Who the hell is ‘info’?! 45 Do Google rankings matter? 50 Quality, yes. But whose quality? 51 What are they buying from you really? Read reviews of this highly-acclaimed strategic marketing book, ebook and audiobook. David is a popular inspiring and entertaining keynote speaker on marketing at conferences and events world-wide. He is one of the most respected international creative industries keynote speakers on creative enterprise, the creative economy, the creative and digital industries, cultural enterprise and creativity in business. As a marketing expert, David speaks about creative marketing, international marketing and marketing strategies. He is a leading international expert in strategic marketing for creatives. He is a UK creative industries expert the author of two books on creative business and strategic marketing. David delivers keynote speeches at conferences and other events for creative, digital and cultural enterprises, policy makers, creative industries support organisations, creative hubs, creative startups, creative cities, and creative businesses in other sectors. He brings his experience of working with design, media and technology businesses to his speeches. David remains in touch with business issues and innovative growth models through his work as a business adviser, leadership coach and marketing consultant. His speeches include examples of successful creative businesses and creative industries support projects worldwide. David often gives speeches and presentations on the subject of International Business. He speaks about international marketing, business etiquette, international marketing communications and global business. His stories and case studies draw on his own extensive international experience and research. He’s an expert in Marketing for Creatives. In this strategic marketing book, David illustrates key strategic marketing messages by drawing on proven techniques and examples from his own experience as an entrepreneur and from the successes of his clients worldwide. ‘Chase One Rabbit’ is about Marketing for Creatives. It’s about strategic marketing for creative industries and focuses on creative industries marketing for entrepreneurs involved in creative, cultural and digital enterprises world-wide. It’s also a specialist creative industries audiobook focusing on marketing for creative, digital and cultural businesses. As a creative business strategic marketing ebook, it offers marketing advice to creative entrepreneurs worldwide.